The year 2013 holds many possibilities and promises. It, however, depends on you how you choose to leverage these opportunities. You will also need to be vigilant about your health. Besides, joint finances, joint investments, matters related to in-laws, issues related to inheritance etc. may remain in the spotlight. Your equation with your parents may change, and you may feel powerful, both socially and professionally. You also need to be alert regarding your career. You may also be inclined towards spirituality. You may also become unconventional and path breaking in your approach this year. Aries people are free-spirited and don't tangle themselves too much on the domestic front. However, this year don't remain passive to the to some domestic dramas that may be unfolding now. During the first quarter of 2013, the home front may become a reason of stress and pressure which may make you irritated. Also, you may have to travel frequently during the first half of the year. Adjustments would be required for you to function optimally. Things may improve dramatically during the latter part of the year and you may even buy a new house, office or vehicle. There isn't much change predicted in your love life in the year 2013. If the relationship was good in the previous year, expect it to be same this year. However, if the relationship was wobbling the previous year, you may need to do a serious rethink. You may also have to try hard and strike balance. Stress on open dialogue with your partner and demonstrate the depth of your love. Also, you should work on your relationship and make it happier. You may embark on a leisure trip with your beloved post June 2013. You shall have a strong intuition this year and will listen to the voice of your soul. You and your inner self may feel robust this year. However, same cannot be said of your physical health and your body may need appropriate care and attention. No serious health issue is envisaged for you and there is no need to panic on health related issues. 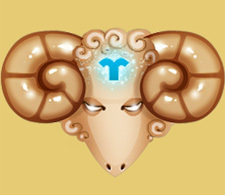 Aries people are advised to avoid over exertion and physical/mental stress. Don't over indulge yourself, especially in dieting and exercise. You should find balance and maintain it. You may experience changes on your career and work front in the year 2013. Be careful! You shall need to work extra hard to get a position of power and status in the realm of your career. However, in this quest of yours, you may make a wrong decision and may do a rethink on it as the year ends. Hence, you need to be cautious while taking any major decision. Those of you running your own business may find the going tough, but you will rise up to the challenge well. Short distant trips may turn out to be beneficial for your business ventures. Don't haste in grabbing any opportunity and keep your patience. Apply your rational and logic to the best. Also, remain diplomatic as you explain your stance over the unconventional approaches you seem to take this year. Listen to the voice of your soul to achieve success. Please note that the given predictions are meant to provide you a general, Sun-Sign based overview. You can also unravel the mysteries hidden in your Birth Horoscope, and get practical remedies to soothe your life, love, career, business and more with one of our very Special 2013 Reports. © 2019astrologypredict.com. All rights reserved.